Good meetings require a few things – an owner, an objective, and an outcome. But an even more fundamental part of any good meeting is making sure you need to be there in the first place. As a company grows, so does its need to communicate. As new employees join, and new teams are created, meetings are seen as one of the best ways to keep everyone on the same page. But it’s a mistake to assume everyone needs to be on the same page at all times. Great companies contain many pages. The art is knowing who needs to be on each one at any given time. 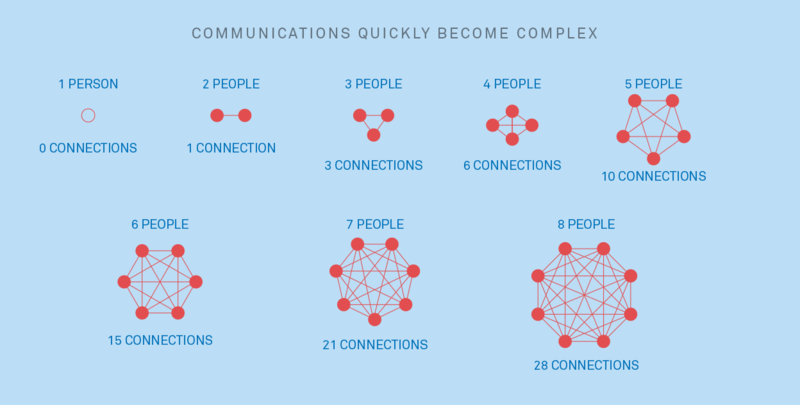 Whether it’s meetings, email, or Slack messages, it’s worth remembering one of the most important principles of communication: the more communication there is, the more difficult it is for communication to succeed. You can determine the impact this has on any meeting by using Brooks’ Law. If adding people to a late software project makes it longer, then adding people to a meeting only makes it longer too. To put this into context, consider an 8 person meeting. On the face of it, an 8 person meeting might not look so complex. But for every person you add to a meeting, the need for communication rises dramatically. Using Brooks’ Law (for the mathematically inclined, the formula is (n2-n) ÷ 2 ), an 8 person meeting actually results in 28 connections. The impact of maintaining 28 connections cannot be underestimated. Each one of these connections takes attention and focus. And attention is one of the scarcest resources at startups. If you’re at a meeting you don’t need to be at, you’re not focusing on what could be a much better use of your time. So next time you receive a scattergun meeting invite, ask yourself – do I really need to be there?